Miscellaneous Musings: Le Marche Americain Est Futile? Le Marche Americain Est Futile? President Emmanuel Macron of France achieved the impossible. 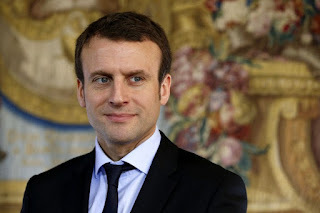 His center-left party En Marche! just won a huge majority in the French parliament, 361 out of 577 seats, after two separate rounds of voting, despite the fact that En Marche! was only formed a year earlier. The two major parties in France, the Republicans and the Socialists, are in free fall because they no longer represent the concerns of the average Frenchman, and Marine Le Pen's National Front has been discredited as well. So here's the thing. Why can't we in America do what Macron did - start a new party? As I type, the U.S. Republican Party is in a quagmire, hobbled by factions and despised for its love for power for power's sake, but the Democrats are so bewildered and completely out of touch with average Americans that they are on the verge of Whig-like extinction. (Jon Ossoff in Georgia and Archie Parnell in South Carolina both lost their respective special U.S. House races yesterday, meaning that the Republicans have held every one of their five congressional seats - four in the House, one in the Senate - up for special election since Trump was elected President.) Both parties continue to stifle legislation that would benefit ordinary people at the expense of their wealthy benefactors, and both count on fear tactics to get the few people who actually bother to vote to continue to support them. We need a new party to address the concerns of ordinary people and make the economy work for everyone, as well as provide equality and fairness for everyone. We need to to do something about health care, infrastructure, Wall Street reform, education, and so many other things, and neither party seems to be either willing or able to do a thing about any of this, despite their rhetoric. Look, the Republican Party was formed in 1854 to fill the void left by the Whigs, but the party grew rapidly, and by 1860 the party had won the Presidency. And the only technology they had to organize themselves with was the telegraph. Don't tell me that, in an age of cell phones, the Internet, TV and radio, people can't form a new party in the United States and get it up and running in a year. Then again, maybe they can't. Maybe too many Americans have just gotten too apathetic, or may they're just too pathetic. Maybe too many of us would just rather not get involved to preserve our own interests. Once upon a time, we taught the French democracy; now, it appears that the student has become the master. And to those who say that Citizens United makes forming a new party impossible here, and that ordinary people can't make a financial contribution to a start-up party, let me recite two little words familiar to Bernie Sanders supporters - twenty-seven dollars!